Jeff Taborda lives in a faded green trailer in an old but neatly kept motor home community in north Las Cruces. Taborda,23, graduated in December from New Mexico State University with a degree in criminal justice, with ambitions to go into law enforcement and eventually join the FBI. He is lean and muscular, working out regularly with his younger brother, Steven. The home Taborda shares with his girlfriend is sparsely furnished, clean dishes in a rack in the sink. The mess Taborda’s family is in won’t be nearly as easy to clear up. Jeff Taborda and his parents are part of an increasing number of undocumented immigrants being targeted by Immigration and Customs Enforcement under recent guideline changes from the Trump administration. “Right now we are seeing people who are actually longtime contributors to the communities that they live in and have committed no crimes to justify their deportation or their families’ separation,” said Vicki Gaubeca, director of the American Civil Liberties Union of New Mexico Regional Center for Border Rights based in Las Cruces. Memos issued by Department of Homeland Security Secretary John Kelly on Feb. 20 give direction to ICE, Customs and Border Protection and U.S. Citizenship and Immigration Services that implement President Trump’s executive orders on immigration enforcement. The memos countermand Obama administration policies that placed enforcement priorities on undocumented immigrants with serious criminal violations and newer arrivals. The memos also place an emphasis on detaining immigrants and asylum seekers rather than allowing them to remain in the community while their cases are being considered. “Basically what Trump has done is make everyone eligible for deportation,” Gaubeca said. ICE did not respond to questions about the shift in immigration enforcement in the Borderland region before publication. The Taborda family came to the United States from Colombia on tourist visas in 1998. Francia Elena Benitez-Castaño and her husband were professionals in Colombia, she an accountant and he a Spanish professor. They brought their 4-year-old son Jeff to Miami to escape drug-related violence in their home country, Jeff Taborda said. The family moved brieﬂy to El Paso, applied for asylum and settled in Las Cruces, where their son Steven was born in January 2002. In November of that year, their ﬁnal appeal for asylum was denied. They waited for a written notice to leave the country. It never came. And, they stayed. Benitez-Castaño never told Taborda he was not a legal resident. He had a Social Security number issued to him while his family was applying for asylum. He went to the local public schools, got a driver’s license (until 2016, New Mexico issued identical licenses to both citizens and undocumented immigrants) and he was accepted to NMSU, which has a policy of not asking for immigration status. Taborda learned he was undocumented on May 9, 2017 — the day he was pulled over by an ICE SUV and detained near his home. That morning was a normal day for the Taborda family. Jeff’s father had left around 7:30 a.m. to take Steven Taborda to the hospital for therapy. The family asked that the father’s name not be used, and his whereabouts are unclear. Benitez-Castaño left about 8 a.m. for work. She was pulled over and detained. About 10 minutes later Jeff Taborda left his home to take his girlfriend to Dona Ana Community College and was stopped. He was detained for three days, but was released because he is eligible for the Deferred Action for Childhood Arrivals program. The chaos and disruption the Taborda family is experiencing is not an isolated case. Immigrant rights groups, the Mexican Consulate in El Paso, immigration lawyers, the immigration courts and detention centers are seeing the effects of the shift in enforcement. Antonio Williams, an immigration attorney in El Paso for the past ﬁve years, explained that there are two types of immigration courts, one for those who are detained and one for those who are released. Until recently, the court for those who were not detained had a larger caseload. That has shifted as the administration put an emphasis on detaining those undergoing removal proceeding. In this region, the number of judges ruling on those cases has been doubled. Four judges have been added in the Chaparral processing center to the four or ﬁve working in El Paso, Williams said. And it’s still not enough, he said. 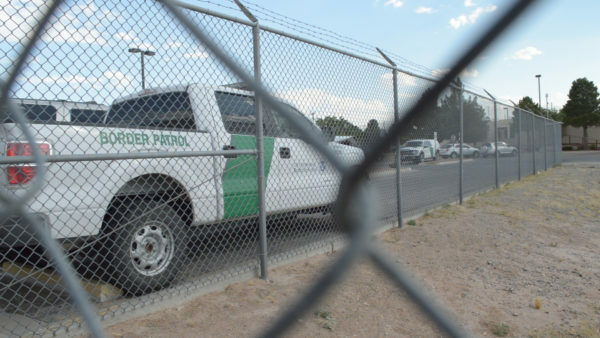 The administration has authorized a judge in Denver to hear cases from El Paso, and because there is not enough detention space in El Paso, some detainees are being housed in a county jail in Cibola County in New Mexico. The changing focus in immigration enforcement leaves advocacy groups and the Mexican Consulate in El Paso with few options other than to help undocumented immigrants know their rights when confronted by ICE and Border Patrol agents, and to help make arrangements for their U.S. citizen children. Gaubeca said that since the February enforcement memos were issued, they have seen a four-fold increase in the request for “Know Your Rights” workshops. The community activist group NM Comunidades en Accion y de Fe has begun to plan seminars on powers of attorney to help families make plans for their children in the event that they are detained and deported. The Mexican Consulate in El Paso in May opened a legal advice window for Mexican nationals to advise them and scheduled four packed seminars on applying to regularize immigration status. The Tabordas had the foresight to make plans for 15-year-old Steven Taborda. When Benitez-Castaño was detained, most of the preparation was ready to give power of attorney to a family friend to become Steven’s guardian. His father signed the paperwork. But everything else is uncertain. Even though Benitez-Castaño has stopped ﬁghting her order of removal and has offered to pay her own way back to Colombia, the family still does not know whether she will be released to settle her affairs in the United States. The government is seeking to bar her from re-entry into the U.S. for at least 10 years, and Steven cannot sponsor her return until he is at least 21. Jeff Taborda has applied for DACA status, but does not know when, or if, he will be approved for protection from deportation to a country that he does not even remember. He is hopeful he will get DACA approval and a work permit. Because he is undocumented, he lost an internship at the FBI, and he has shifted his focus from law enforcement to becoming a home insurance claims adjustor. This multimedia story was produced for the 2017 Dow Jones Multimedia Training Academy by Toni De Aztlan, Mariam Betlemidze and Sylvia Ulloa.